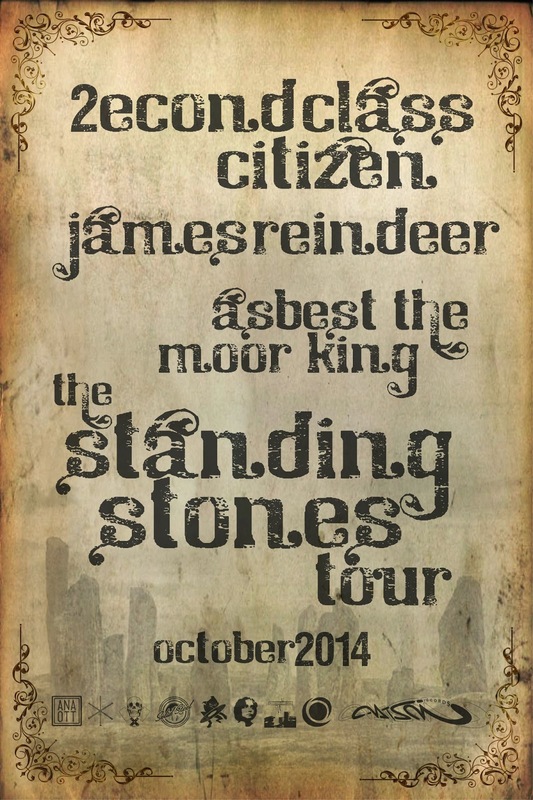 might we very proudly, and very excitedly, announce the standing stones european tour, featuring the combined talents of 2econd class citizen, jamesreindeer and asbest the moor king, representing the united kingdom, and combined together live on stage for the very first time. having already performed together in separate constellations in locations ranging from glastonbury festival, bochum, and brighton; this tour will finally see them together as a trio, operating both seperately and together, in venues across germany, switzerland, austria and the czech republic. having also already secured their reputations individually, both on record and within the live arena, we are now poised to witness a full-length tour that shall display the current heights of their own solo performances, as well as giving us ample opportunity to witness live collaborations, both pre-planned and improvised, which shall pitch and sway, vary and alter between shows; spontenaity will abound. be sure to seriously think about trying to find yourself at one of these performances, and should you be a promoter, then please do not hesitate to contact any one of the artists involved in order to help us secure shows for the last few spare days currently laying unbooked. be sure to get involved in any and every capacity possible, and please do help spread the word, this is surely some ‘once-in-a-lifetime’ business for sure.